War is destructive by its very nature, and World War II was the most destructive war in history. Aside from the tens of millions of military personnel and civilian deaths, the war brought unprecedented ruin to the thousands of villages, towns, cities and industrial areas through and over which the war was fought. The nearly immeasurable physical and financial impacts of WWII rippled for decades to come, including enormous effects on buildings and other physical spaces worldwide. 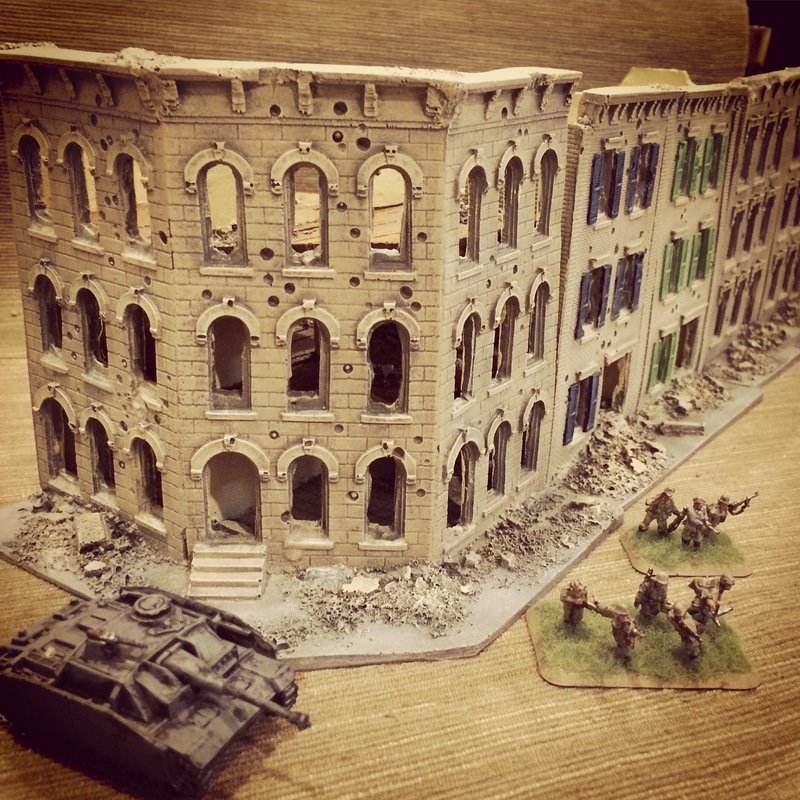 For my 15mm WWII wargaming using Flames of War and I Ain’t Been Shot Mum rules systems, my terrain has been modeled almost entirely on Western Europe using buildings from numerous manufacturers collected over the past few years. 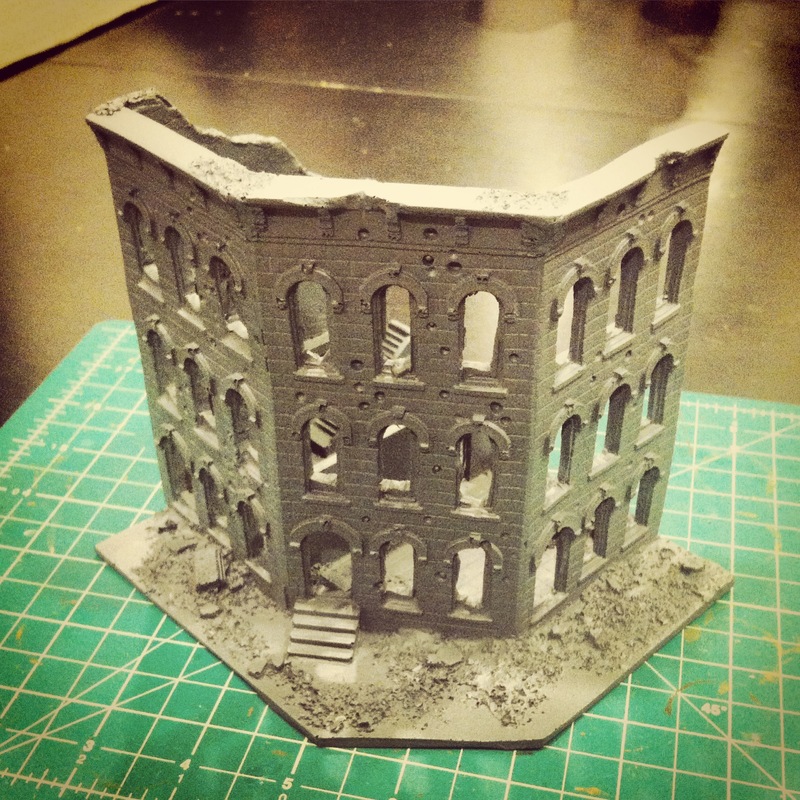 In all my 15mm modelling, destroyed buildings have largely been absent so far, so I’ve been really happy to add my new city block ruin models from Novus Design Studio to my terrain collection. NDS was founded just about a year ago in April 2014 by Robert and Nancy Rumfelt, the founders and original owners of JR Miniatures. 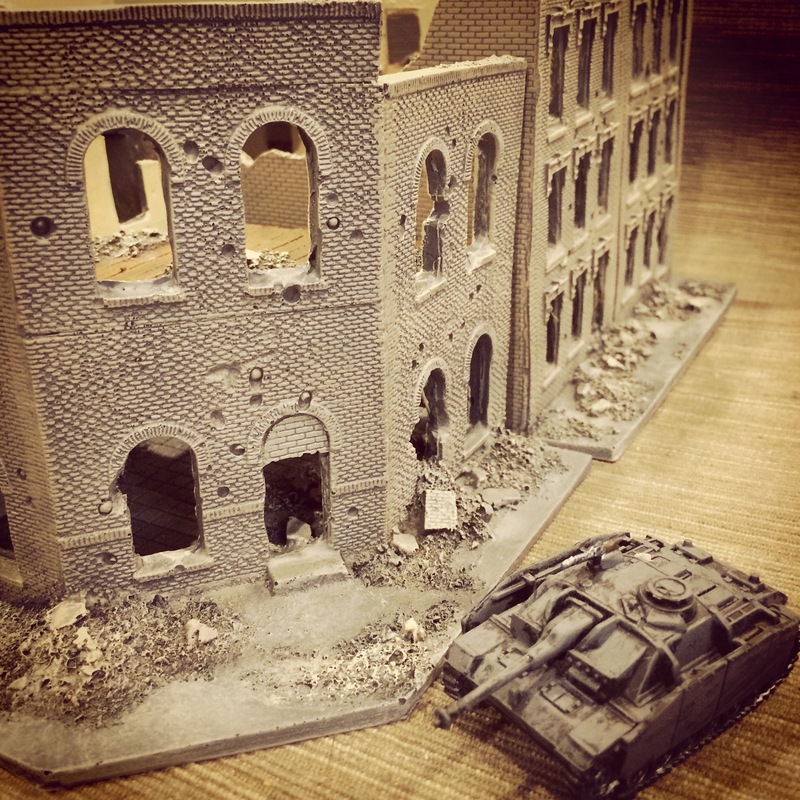 Like many wargamers, I’ve got a long history with models from JR Minis and so in many ways I knew what to expect from NDS when the company’s launch was first announced. I watched their inventory grow in the past year covering 6mm, 15mm and 28mm scales across WWII, sci-fi, fantasy and modern themes, and they’ve continued to add new products in the new year. The two and three story 15mm urban ruins retail for $26-31 USD each but I picked up a full set of four in a 40% off deal NDS ran at the end of 2014. The straight and corner buildings match up nicely together in a row or bunched into a city block in various configurations. The models also look great placed among buildings from other manufacturers, especially other city row houses from JR Minis. The castings in a creamy resin require a little flash clean up with a sharp hobby knife and air pocket holes show up here and there but don’t distract from the destroyed nature of the structures. 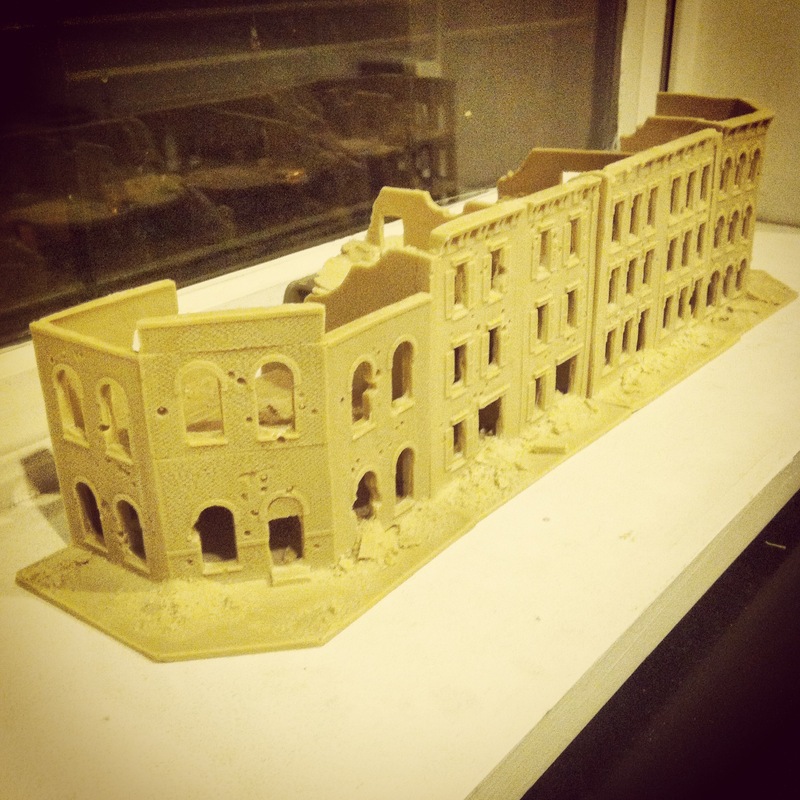 All the NDS city block ruins feature removable floors molded with plank floors, piles of rubble, walls and interior doorways. The buildings have staircases and walls on the interior, broken window panes and more rubble on the attached sidewalks at the front. 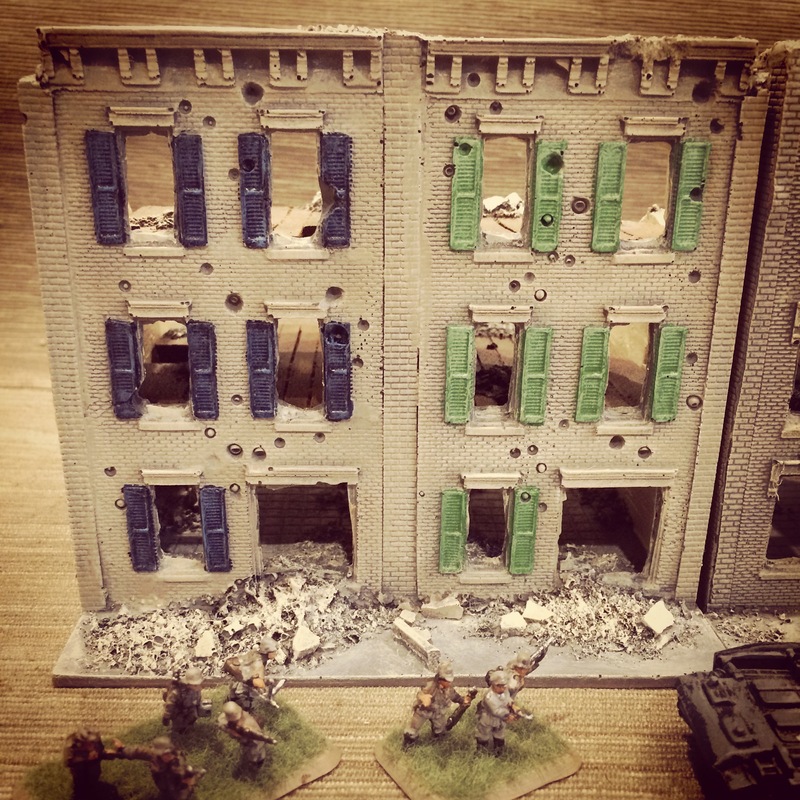 Everything about these make them very usable for 15mm gaming whether it be for 20th-century historical scenarios or contemporary and near-future gaming in European or even American urban settings. 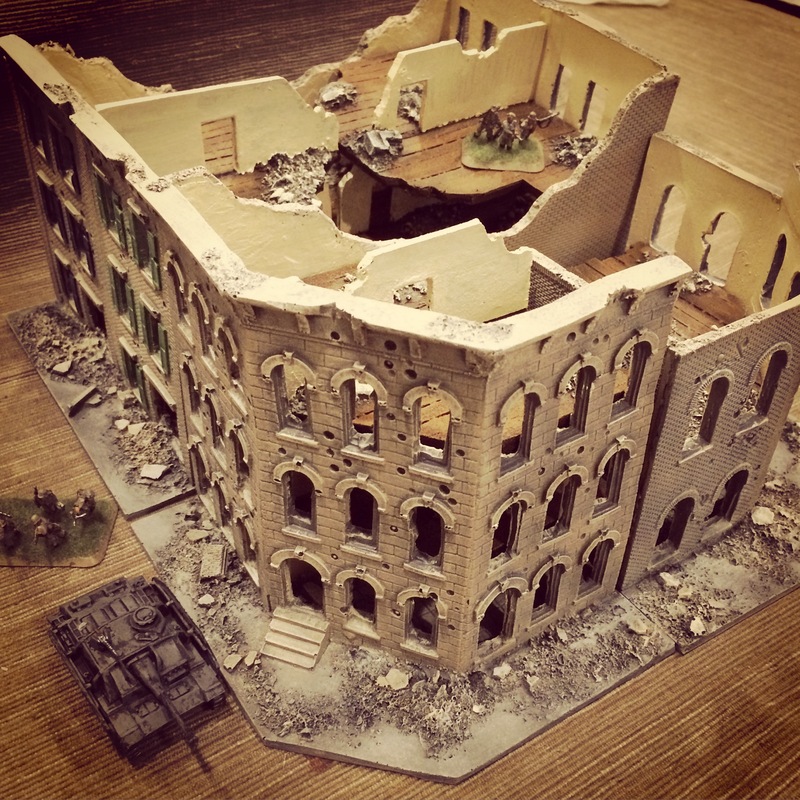 Getting multiples of the models on the table would easily allow setting up a truly impressive cityscape ravaged by the impacts of war. After cleaning up the flash on the models, I washed them all in warm soapy water to remove excess casting residue. The main building structures got a spray of flat gray as a base coat followed by layers of dry brushed tan, light gray and off white paint on the exteriors. Sidewalks also received grays and off white to highlight piles of ash and broken masonry heaped on the ground. On building had shutters which were painted in a dark blue and green and then highlighted with the same color mixed with a bit of white. For the interiors, the removable floor levels were base coated in flat black. Plank floors were built up in layers of browns ranging from dark to light in each coat. I went basic on interior walls, using an off white to create a simple plaster look. 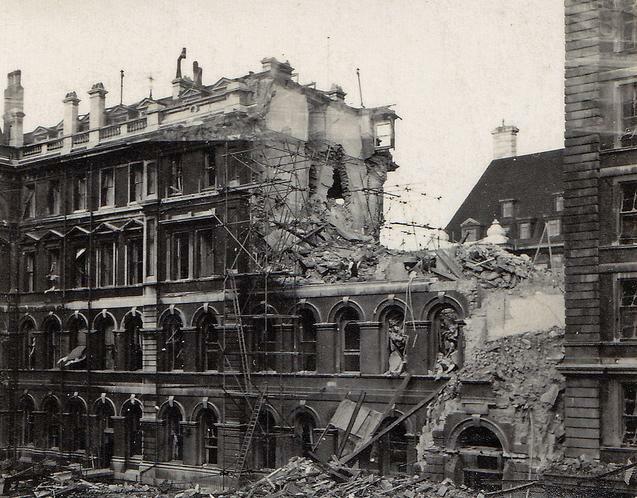 As with the exterior, the rubble and tile floors on the ground floors were built up in grays and off white. 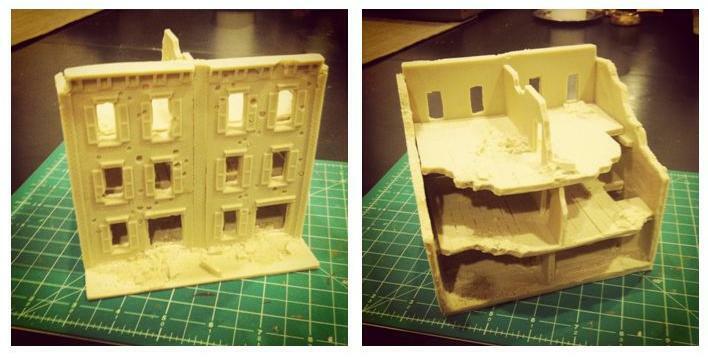 After a finish of a few coats of clear matte spray, the city block ruins were done. 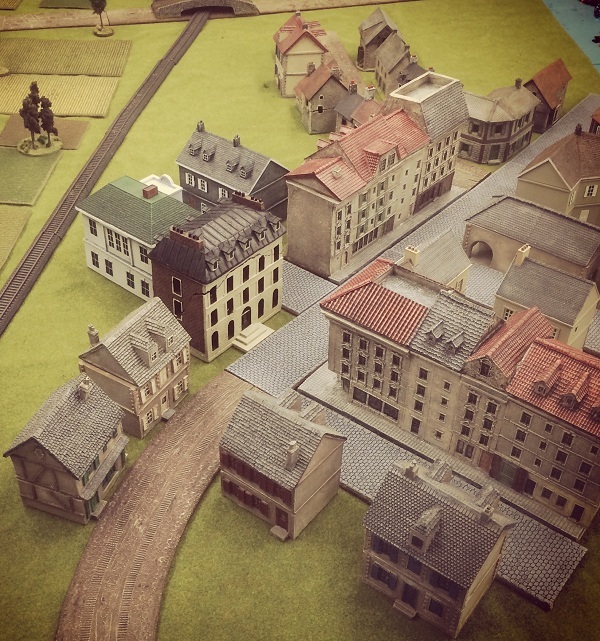 Arranged in a square block or stretched out in a row, these models easily blend in with other 15mm terrain manufacturers and add a great bit of variety to a tabletop set up. 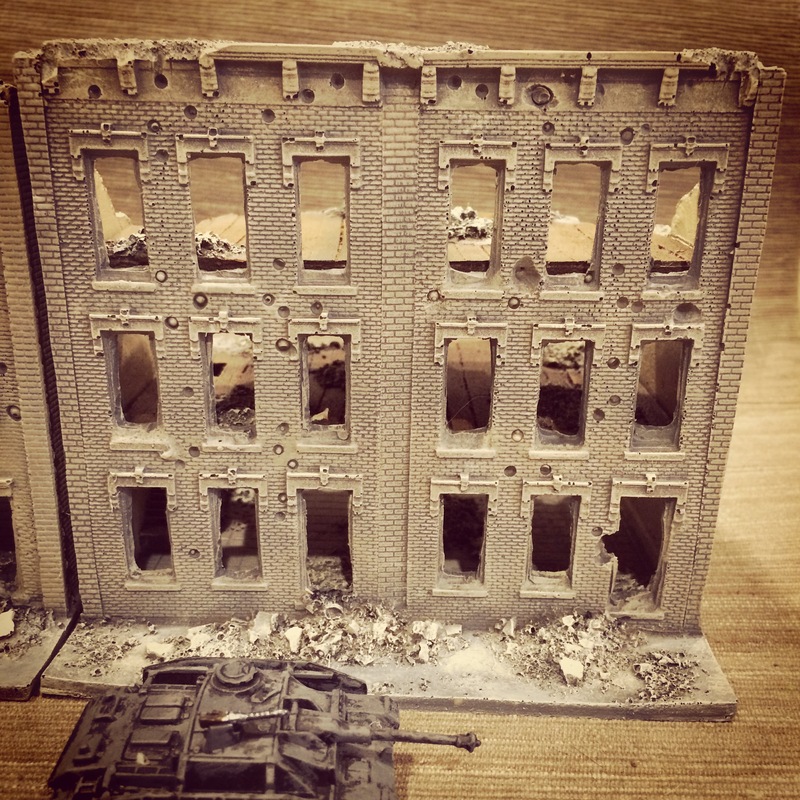 Bringing a bit of destruction to my overly neat wargaming battlefields is a welcome addition with my first buildings from Novus Design Studio.